Denny Hamlin was fined $25,000 today for his statements after the Phoenix race. 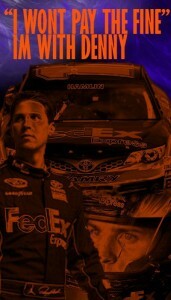 Hamlin said that the car new gen6 car wasn’t any better than the previous car and was extremely hard to pass. Denny was just giving an honest assessment of the car and was fined for it. Denny has sourced many new fans from the whole ordeal, who believe Denny shouldn’t have been fined. 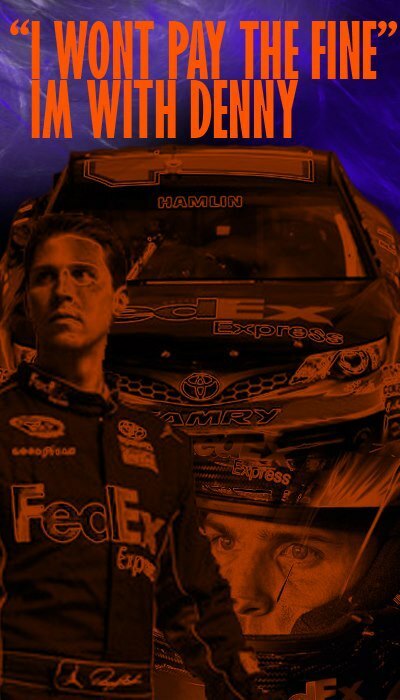 A new hashtag #standwithdenny has begun to spread on Twitter as we see unwavering support for Denny Hamlin. Here is Denny’s reaction below in both a written statement on Twitter, and video. “The short of the long of it is I believe I was severely disrespected by NASCAR by getting fined. I believe that the simple fact of us not even having a conversation about this issue before I was hit with a fine has something to say about our relationship. What I said was 1 sentence taken completely out of context. Most drivers will tell you that we constantly have our AND nascars best interest in mind when speaking. On the other hand I am a person that worked very hard from the BOTTOM to get where I am today and someone telling me that I can give my 100 percent honest opinion really bothers me. Since being fined in 2010 I have been a lot more careful about what I say to media and I felt this past weekend felt completely in my rights to give a assessment of the question asked. Sad day when a driver can not even have a honest opinion without being punished for it. I am now officially a non supporter of Nascar racing!!! Shame on you Nascar: have you never heard of Freedom of Speech, it is a right!